As a sports observer and fan, I can’t let the day pass without remembering New York Yankees owner George Steinbrenner, who died today. He was one of the greatest owners–if not the greatest–in sports, in terms of what he built. He was very charitable and generous (if a tough boss for Yankee employees, who frequently fired underperforming managers, etc. ), according to most reports on him I’ve read over the years. And he was a marketing genius, who built the Yankee empire into what it is today. He turned a team he bought for $10 million into a Major League Baseball franchise worth well over a billion dollars. But, unfortunately, taxpayers were the forced partners in financing that enterprise. Unlike late Detroit Pistons owner, Bill Davidson–who never took tax money for his sports enterprises and privately funded his stadium–Steinbrenner was like most sports team owners in that the Yankees sucked taxpayers of millions to finance the team’s new sports stadium. At the time, Steinbrenner had already handed control of the team over to his sons because of ill health. But it was a project he, himself, pushed for many years before that. 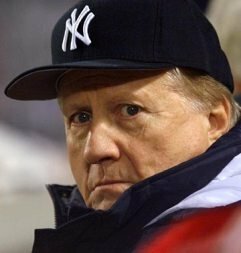 In that, Steinbrenner was not uncommon, but just like any other sports team owner who sucked taxpayers dry with little return on their forced investment. Politically, Steinbrenner’s campaign contributions to liberal Democrats in Congress dwarfed that which he gave Republicans (though recently he gave a lot of money to various Republican entities in Florida). But at the top of the ticket, Steinbrenner was a strong supporter of Richard Nixon and Ronald Reagan (Reagan pardoned Steinbrenner for his role in a Nixon campaign finance scandal) and was also a supporter of New York Mayor Rudy Giuliani. You may remember Larry David’s funny portrayal of Steinbrenner on the NBC sitcom, “Seinfeld.” Reports say Steinbrenner enjoyed the portrayal and he must have, since he did his own cameo “Seinfeld” with actors Jason “Palestinefeld” Alexander and Julia Louis-Dreyfus. Is it offensive to say that I liked Larry David as Steinbrenner better than Steinbrenner as Steinbrenner? And to those who say the Jews run New York, well, George Steinbrenner was Exhibit A that this isn’t true. The guy owned and ran probably THE most powerful entity in the city. And he was a gentile. George Steinbrenner, Rest In Peace. I often wondered why George got “away with” sleeping under his desk while working for Steinbrenner! You are right about these people who feed off the public trough. And the U.S. debt would have been that much greater if Chicago had gotten the Olympics. Bankrupt as Illinois is, and the Fed Govt is becoming it would have been so much worse. This will be a test of some of the new anti-tax governors and politicians; will they stand up to people like Steinbrenner?